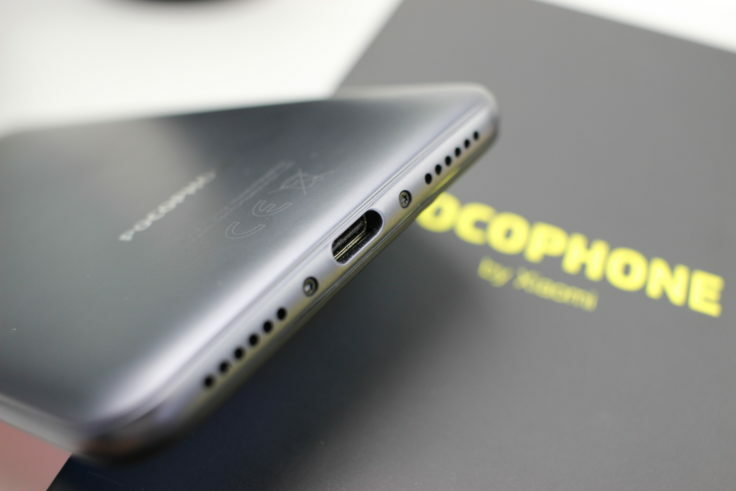 In addition to the Xiaomi Mi Mix 2S, the Black Shark and the Xiaomi Mi 8, the Xiaomi Pocophone F1 is the manufacturer’s fourth smartphone with the Snapdragon 845 processor. The special feature: the Poco F1 is by far the cheapest of these smartphones and is intended for the western market. And surprisingly few compromises are necessary – the Poco F1 offers an unbelievably good price-performance ratio. 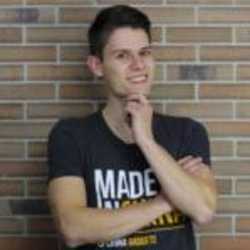 A smartphone that you can unconditionally recommend? You could almost think you shouldn’t associate the Pocophone F1 directly with Xiaomi. You get this impression at least if you hold the packaging box in your hands and have already unpacked several Xiaomi smartphones. 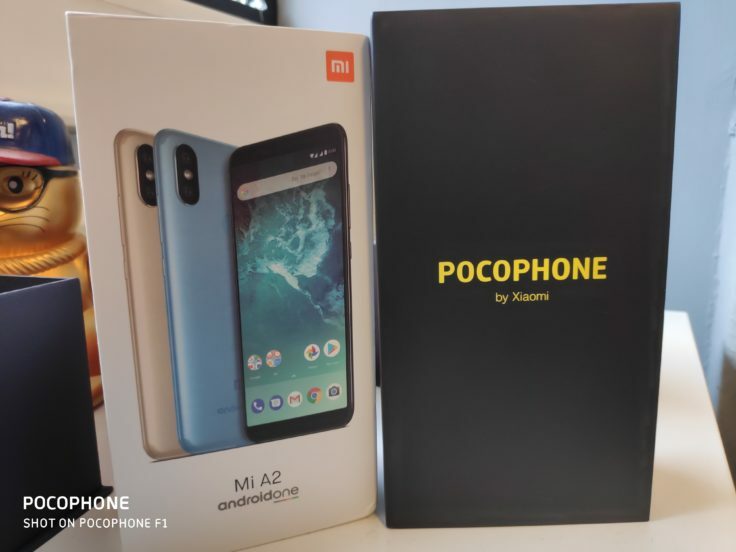 The box is black, like a Mi 8 or Mix 2S, but the eye-catcher is the yellow lettering “Pocophone by Xiaomi”. This yellow-black colour concept runs through the whole packaging, you won’t find the well-known orange Mi logo here – strange. For this there is the red Global Version Sticker, as well as an information about the most important Specs on the back side. Inside the Poco F1 there is a white 1 m USB type C cable, a 9V2A USB charger, the SIM needle, an English operating manual including declaration of conformity as well as a transparent silicone case. That’s a nice bonus, but it doesn’t offer the best quality either. But it should still serve its purpose. You don’t get more – but you don’t need more. Not only in its name, but also in its appearance, the Poco F1 differs quite clearly from the usual Xiaomi devices. However, this is mainly at the back and not at the front. The Xiaomi Mi 8 has taken it over almost 1:1, and of course the Notch is conspicuous. This is also quite large here, as it is the case with the Mi 8. We are dealing here with a 6.18 inch display that is slightly smaller than the Xiaomi flagship. Due to the Notch we have an aspect ratio of 18.7:9 and nicely the panel is even protected with gorilla glass! It measures 151 mm in height and 76 mm in width, which is slightly smaller than the Xiaomi Mi 8. Nevertheless, the Poco F1 weighs a few grams more and weighs 182 grams. Of course, this is mainly due to the larger battery, but the weight is absolutely average and even good for handling in my eyes. This is also reflected in the thickness: with 8.8 mm it is thicker than the Mi 8 and Mix 2S, but even thinner than the Black Shark. The back then makes the difference to other Xiaomi devices. The dual camera is arranged vertically, but centrally in the upper third and thus reminds us more of Vernee or Ulephone smartphones. Right underneath is a fingerprint sensor. Which design one favors now is surely a matter of taste. 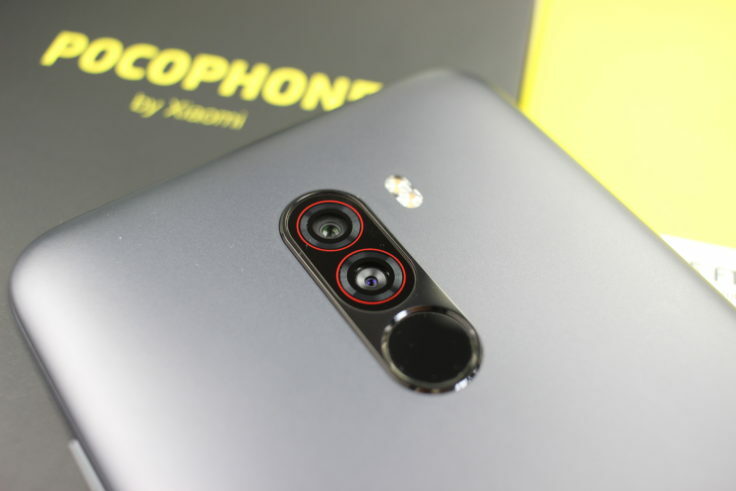 At the bottom is again the “Pocophone” lettering and underneath is among other things the CE mark. But we want to positively emphasize the variety of colors, because the flagship is available directly in several colors: Graphite Black, Rosso Red and Steel Blue. In addition, there are individual cases with which you can protect and individualize your smartphone. The Poco F1 only does limited justice to the rimless claim in the design. The Notch saves some screen margin, but the “chin” (lower screen margin) is still relatively thick. The edges on the sides are still clearly visible, as are the sensors and cameras in the notch. 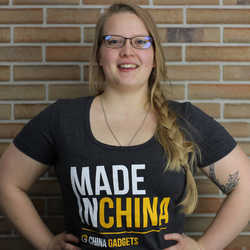 At this price, however, you simply don’t have the resources to perfect the design in this respect, as is the case with an iPhone X or Vivo NEX. Where does Xiaomi save here? That’s the big question. 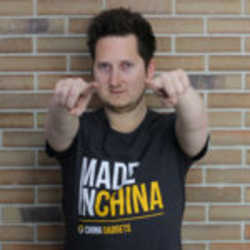 Xiaomi relies on a plastic processing in order to be able to move below the price of the Xiaomi Mi Mix 2S and Xiaomi Mi 8. The Poco F1 is equipped with a unibody made of polycarbonate, while Xiaomi’s own devices are actually already equipped with aluminium unibodies in the upper middle class (Xiaomi Mi A2 or Xiaomi Mi Max 3). But that doesn’t mean that the Pocophone F1 feels cheap or inferior – quite the opposite! In fact, a amateur can’t even tell whether it’s plastic or metal, especially since the workmanship is first-class once again. The case frame is already slightly rounded, so that no edge lies unpleasantly in the hand. The whole back is slightly flattened towards the sides, making the smartphone quite ergonomic. Due to the Notch design, the Poco F1 is even smaller than the Xiaomi Redmi Note 5, despite the larger display. All in all, I like the handling of the Poco F1 very much, the minimal extra weight suits the smartphone well. I also think it’s really pleasant not to use a glass back, because it’s quickly ruined by fingerprints anyway. The smartphone feels very high quality and my concerns that Xiaomi might save a lot in processing quality here are irrelevant. Even though I subjectively prefer the design of the back of all current Mi devices, I find the Poco F1 more than successful in terms of design and workmanship. Poco F1 without AMOLED display – a disadvantage? An important difference to the Mi 8: the Pocophone is “only” equipped with an LCD IPS display and not with an AMOLED panel. The resolution of 2246 x 1080p, however, is appropriately large and thus just as large as that of the Mi 8, this results in a pixel density of 403 ppi, which is considered the current standard. The display of the Poco F1 does a good job. The brightness is really good in my eyes, especially indoors one gets along well with a third of the maximum brightness. 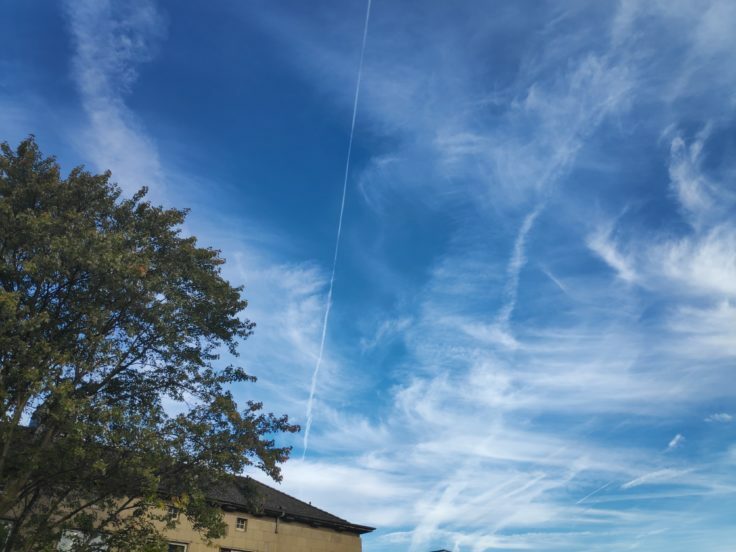 But if you go outside, you should already set the brightness to at least half of the maximum level, and even higher, otherwise the reflection will be too strong. Nevertheless: the color intensity is very good, the colors are warm and the responsiveness of the touch panel is of course also very good. With regard to the viewing angle stability there would be a bit more, but in practice you don’t notice anything of it. Since it is not an AMOLED display, you don’t get an Always-On mode either. But MIUI leaves at least in the settings free space for the personal preference concerning the color style. With a color palette you can individualize the display and choose between three settings for the contrast. We can absolutely compare the display with that of the Mi Mix 2S. In my opinion, both have the disadvantage compared to the Xiaomi Mi 8 or even Mi 8 SE, but they still have the rating “good”. A small point of criticism is also in the detail. 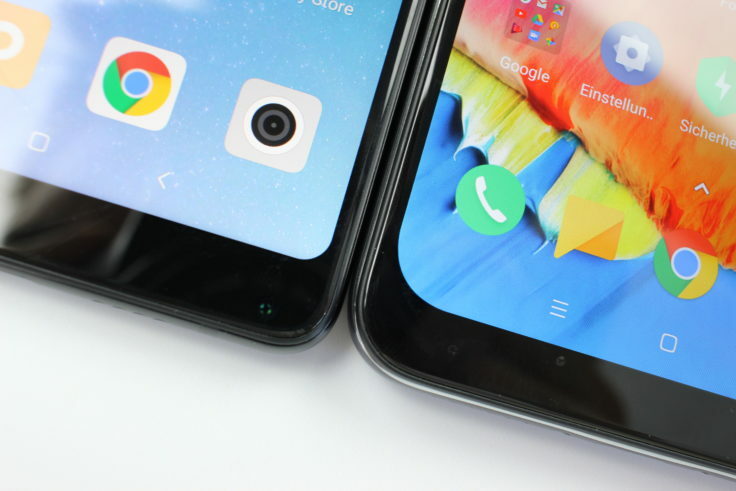 As with all current Xiaomi smartphones, the four corners are rounded. 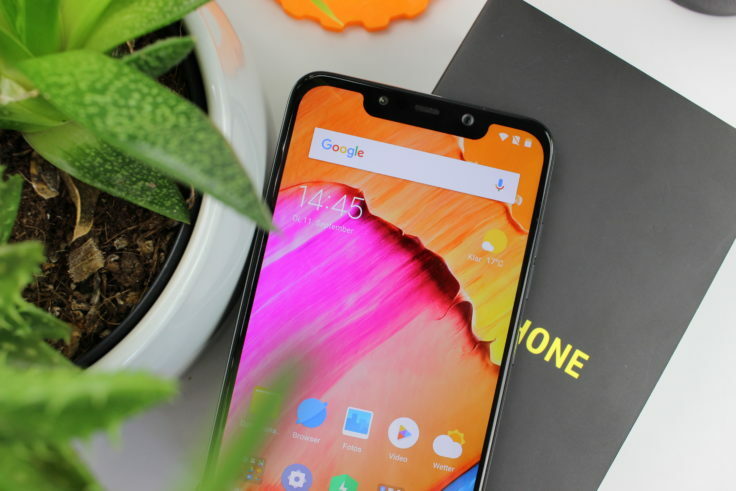 With the Xiaomi Pocophone F1, however, this rounding tends to be even more noticeable, which almost gives the impression of losing some display space. 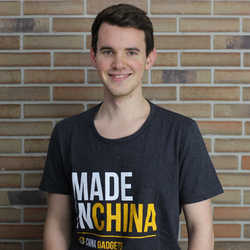 During the test it was reported that a few owners of a Pocophone complain about backlight bleeding in the display. This is a hardware problem that manifests itself in the presence of halos in certain areas of the display. This is due to the fact that light is transmitted through a wrong arrangement of the liquid crystals in the display. This doesn’t necessarily prevent you from using the smartphone, but of course it looks unattractive and shouldn’t happen. It is important to say that the problem has apparently only occurred with very few customers in India so far. Our test device is not affected by this either! This can also be easily checked with a display test. By tapping four times on the “Kernel version” item under “My device” in the settings, you get to the CIT hardware test, where you can also test the display. No backlight bleeding was found there. An important clue for a flagship is the processor used. 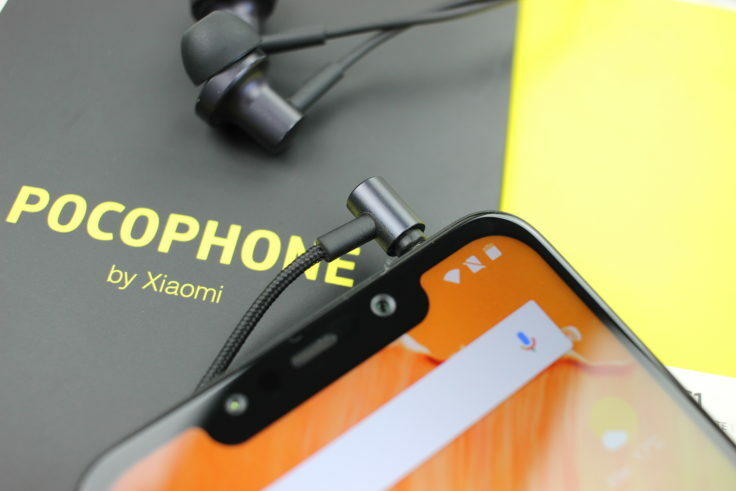 As mentioned at the beginning, the Xiaomi Pocophone F1 comes with the Snapdragon 845 processor, whose performance is beyond doubt. The eight Kryo 385 cores offer a clock frequency of 2.7 GHz and provide massive performance. In addition there is at least 6 GB RAM and 64 GB internal memory which can be extended. Alternatively, you can also invest directly in the 6/128 GB version or even order an 8/256 GB version! And the fact that there is a top processor in it is noticeable in every second of using the Xiaomi Poco F1. I would have expected in advance that Xiaomi might even reduce the power of the CPU a bit. Instead, they seem to have spent a lot of time developing the phone by adapting the slightly reworked MIUI to the hardware. Because the Poco F1 is really fast. The opening and closing of apps is so smooth that I could still enjoy it for several days. Gaming is really fun on the Pocophone because of the immensely good performance! This can also be seen in the benchmarks. Here the Poco F1 can even pocket the competition of OnePlus in the form of the OnePlus 6 at least in the Geekbench benchmark. The benchmarks are all very strong and confirm the good performance of the Xiaomi smartphone. Here there are even better values than with the Mi 8. This confirms our assessment, but should not be regarded as too important. As Huawei unfortunately proved, you can outwit the benchmarks with a certain optimization. 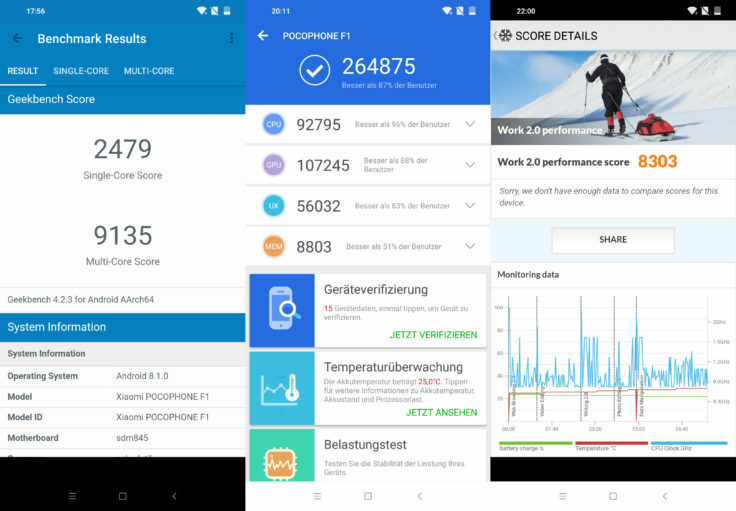 In any case, the Poco F1 also proves how strong it is outside the benchmarks. 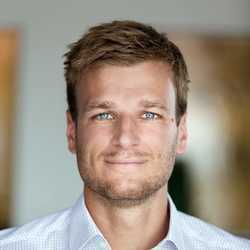 Not least when playing more computationally intensive 3D games like Asphalt 9 or PUBG Mobile. Both run smoothly, both are fun, look really good and don’t even seem to bring the Pocophone to its peak performance. One of the reasons for this is the liquid cooling system, which is used to cool the processor. You probably can’t talk about “water cooling” here, but Xiaomi probably goes similar ways to the Black Shark and uses heatpipes, which contain a liquid that helps to cool the processor. And you notice that, because the Poco F1 stays pleasantly cool even with PUBG. The back remains pleasantly cool even under extreme load. 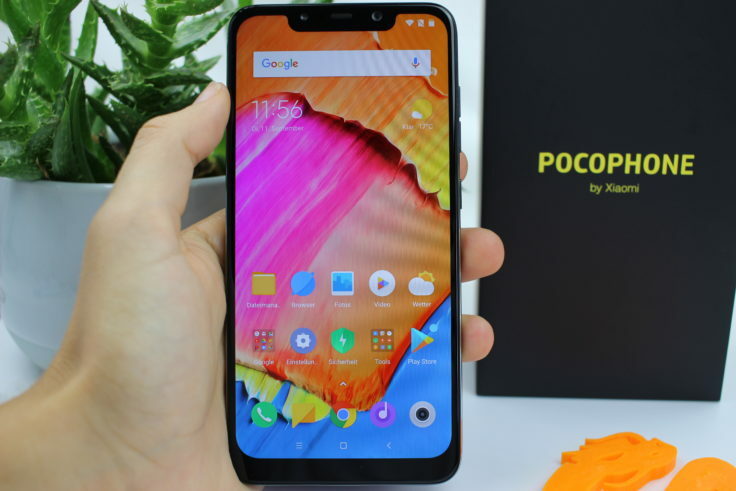 Xiaomi calls the Pocophone F1 itself the “Master of Speed” – and they’re right. In this price range it is simply the fastest smartphone on the market today, after all it is absolutely flagship at a fraction of the price. With the Poco F1, you can easily master any challenge you might have on a smartphone and be on the safe side for two years to come. Even with expensive flagship smartphones, you currently have to make compromises. One of them is usually the battery life. If you consider that the Xiaomi Mi 8 in the Explorer Edition is equipped with a 3,050 mAh battery, you know that it only takes one day. Xiaomi has implemented an advantage of its budget and mid-range smartphones also in the Poco F1: a big battery! A whole 4,000 mAh battery capacity slumbers in the Pocophone F1. This is identical to the Xiaomi Redmi Note 5, which – of course also due to a weaker processor – can shine especially in terms of battery life. And indeed: the Xiaomi Pocophone F1 is a battery monster. Our benchmark test showed 12 hours and 36 minutes screen-on time with medium brightness and WLAN switched on! 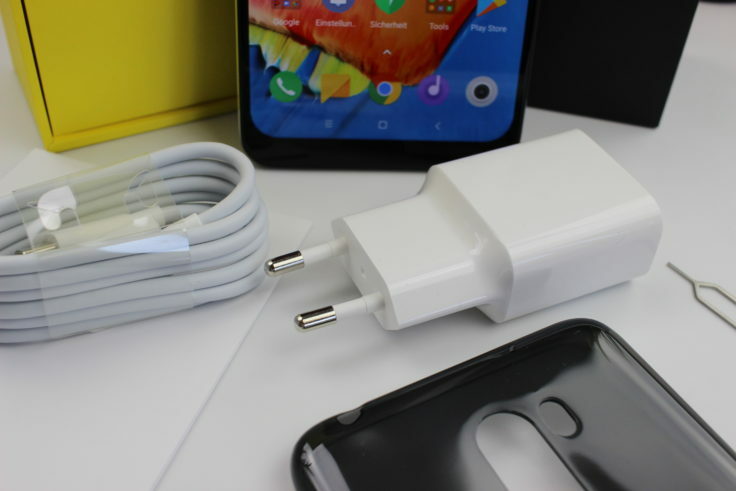 Wow – you can easily make ends meet for two days without the Poco F1 having to see the power outlet. The Black Shark with the same battery capacity has a battery life of 11 hours, the OnePlus 6 for example only 7 hours and 30 minutes. If a long battery life is important to you, the Poco F1 is the best choice. No other smartphone with this hardware equipment comes up with such a value! But as soon as the Poco is empty, you have to invest a good hour and 45 minutes with the supplied cable and adapter to fully recharge it! The Poco F1 Quick Charge 3.o supports this. The camera is a dual cam and combines a 12 megapixel sensor and a 5 megapixel sensor. This is most likely the same constellation as in the Xiaomi Mi 8 SE. The main sensor is actually the Sony IMX363 with an aperture of ƒ/1.8, which takes very good photos. Unfortunately, the secondary sensor is not a telephoto lens, but also a wide angle sensor. So we don’t have an optical zoom here. 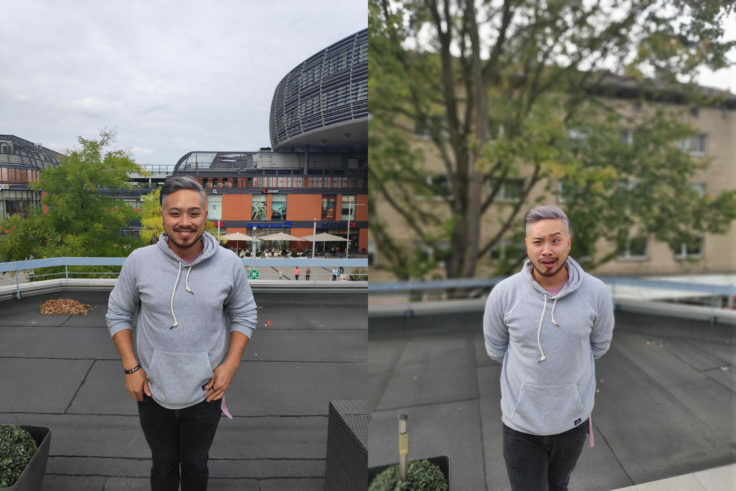 In portrait mode, the weaker secondary sensor compared to the Mi 8 and Mix 2S is most noticeable. First, portraits lose their portrait character due to the shorter focal length and with very fine details like hair the lens doesn’t collect enough details to get the edge detection flawlessly. 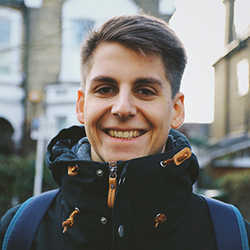 Nevertheless: the portrait photos are good and considerably better than those of the competition from China, apart from OnePlus. The bokeh is not too artificial as with Huawei and the edge detection is 90% reliable. In addition, there is a 20 megapixel sensor on the front, which is also taken from the Xiaomi Mi 8 or Xiaomi Mi A2. Accordingly, Selfie fans get their money’s worth, both in normal mode and in portrait mode. I’m still impressed how well Xiaomi manages the portrait mode for the front camera. Both the resolution and the sharpness leave nothing to be desired. I’m actually quite surprised by the video quality of the Pocophone. I like it very much, the Full HD resolution is very good for the smartphone display, on a monitor it gets a little spongier, but I like the colors and the autofocus really good. The sound is also very good, if the background doesn’t have a lot of background noise like in the front camera test. I also like features like the slow motion, but in 120 fps, i.e. fourfold slow motion, everything looks good. The housing frame offers a lot of connections. A hybrid SIM slot is part of the smartphone, so memory expansion is possible, but you have to get by with a SIM card. There is also a USB type C port on the bottom and a 3.5 mm jack port. This is a clear advantage over many other Xiaomi smartphones. Since the Mi 6, the manufacturer’s flagships have dispensed with the headphone jack. The only thing you unfortunately have to do without is NFC, which is of course a bit annoying especially in view of the Google Pay launch. On the underside there is a loudspeaker next to the microphone. Together with the auricle, it forms a stereo loudspeaker that doesn’t quite live up to its name. The volume is divided in a ratio of 90:10, so the omission of the sound from the auricle would hardly be noticeable. The sound itself is completely okay in my ears and even quite loud. But it convinces especially with videos from YouTube or Netflix. Apropos Netflix: As is the case with all Xiaomi devices, the Pocophone F1 only supports Widevine Level 3, so it can’t play streaming content from Netflix & Co. in HD. Some have seen this as a big point of criticism, but it’s not particularly negative for me. Firstly, the picture quality at 6 inch display is still really okay even with 520p and secondly, only a few people should really watch Netflix several hours a day on their smartphone. If you count yourself among them, you should consider buying the Pocophone, here you have to make do with Samsung or Apple. For anyone who only looks at streaming content (YouTube isn’t one of them!) on their smartphone from time to time, this shouldn’t be a big deal. If you have ever held a Xiaomi smartphone in your hands, MIUI is no stranger to you. The operating system strongly adapted by Xiaomi is based on Android, but differs from Stock Android both by its appearance and by its functions and Xiaomi apps. 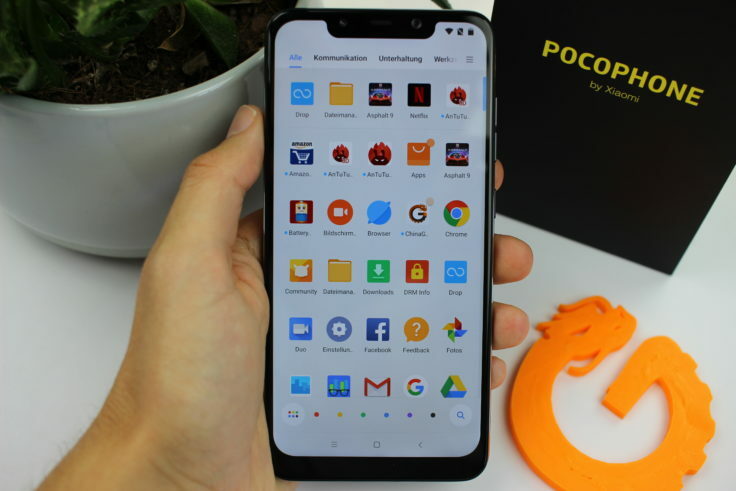 It is interesting that the Pocophone F1 comes on the market with an adapted MIUI operating system. 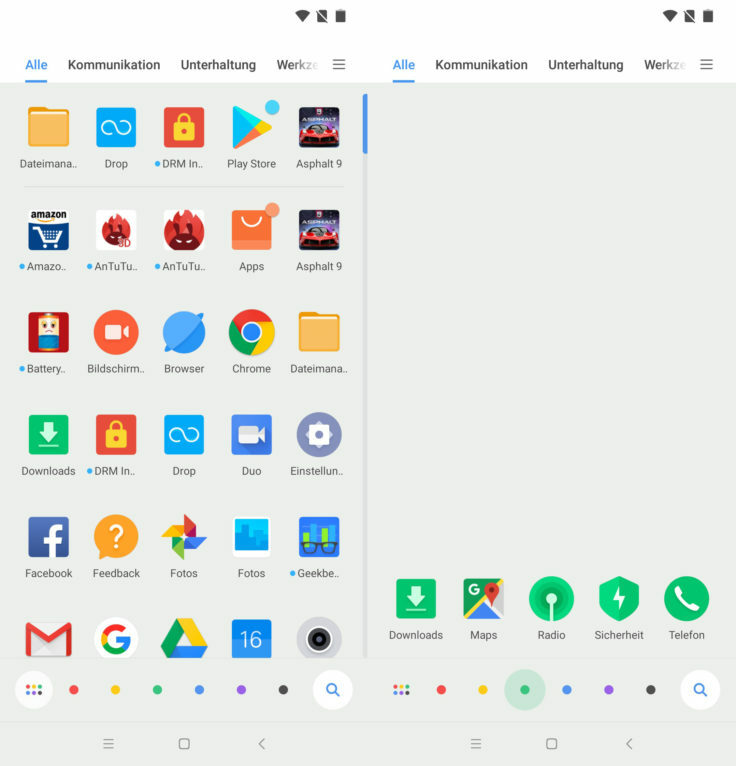 A new Poco launcher with App-Drawer has been developed for this purpose, which will also land in the Google Play Store in the long term. Friends of Custom ROMs also get their money’s worth, as the F1 comes with an open kernel. All Google services including the Google Play Store are pre-installed. The App-Drawer reminds us of the current Android One devices like the Mi A2. This is probably the way to present something to the new, European customers that they already know. 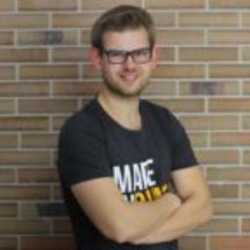 In addition, however, there are many apps from the company’s own development department. Among them for example Mi Drop, Mi Cloud or Mi Community, which you can uninstall almost without exception. MIUI 9.6 Global Stable is delivered on the Poco F1, but during the test period there was already a first update to MIUI 9.6.14. 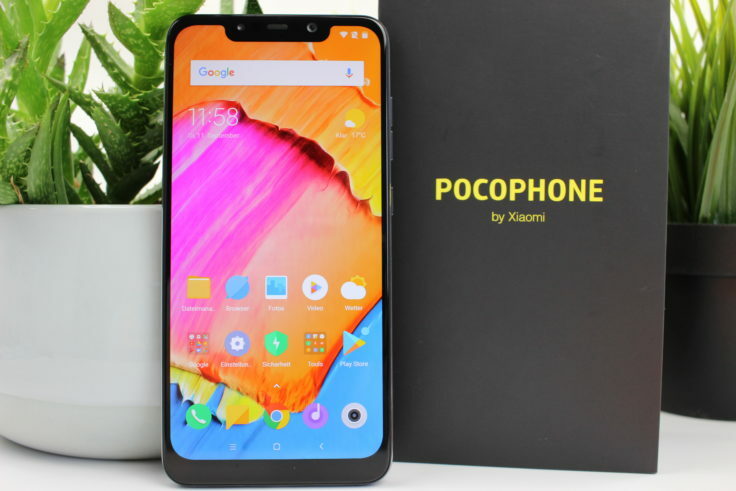 In my eyes, the switch for Xiaomi beginners – no offense 😉 – to the Pocophone is easier than to a “normal” MIUI device from Xiaomi. If you like, you can of course also install another launcher. You can also be informed about notifications by means of the notification LED, which only lights up white and can blink during notifications as well as during recharging. 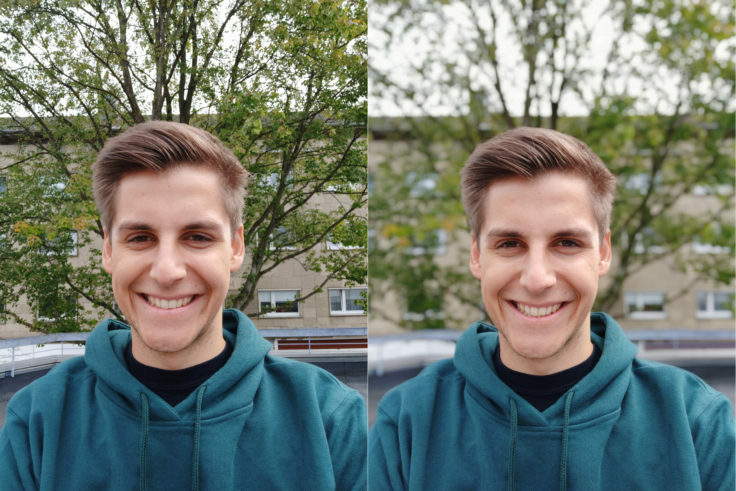 One of my favorite features of the Xiaomi Mi 8 was the Face Unlock, which can be found in the same form in the Pocophone Poco F1. The Notch is big, but this is due to the technology it contains. In addition to the 20 megapixel front camera sensor, there is also an infrared camera and an infrared sensor. This makes sure that the face unlock really works very fast and reliable. In addition, you can unlock your smartphone with your face even in the dark, which also works perfectly. However, the Face Unlock function is hidden in the settings. You actually have to set the region to India under “Further settings” in the settings, so that you can manage the face data under “Lock screen & password”. But this doesn’t have any disadvantages and works perfectly. Alternatively, you can use the classic fingerprint sensor on the back of the Xiaomi, which is typically lightning fast and reliable. 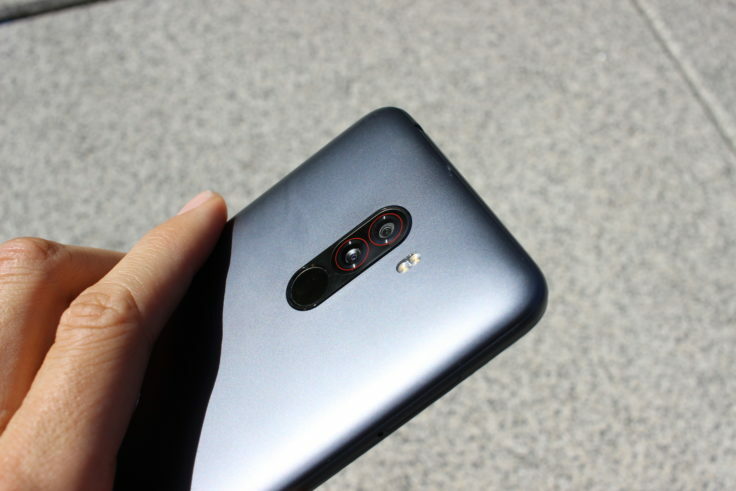 Beside the “normal” versions of the Pocophone there is also a Pocophone F1 Armored Edition. The backside of this version is made of Kevlar Aramid fibres of the manufacturer DuPont. The material is especially heat resistant and is used a lot in the military. This should protect the smartphone even better than with conventional plastic processing. Although this does not provide any protection against dust and water, anyone who likes the look and wants even better workmanship will probably find what they are looking for here. If you leave the Notch out of it, almost everyone can agree on the Xiaomi Pocophone F1. In fact, the Poco F1 convinces in almost every discipline, but especially with the pretty good dual camera, the really powerful processor and the almost unbeatable battery life. 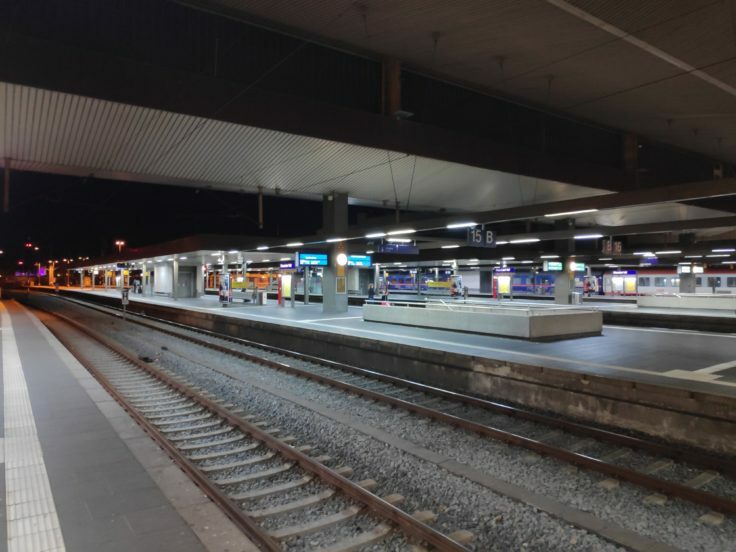 In addition there is a very clean workmanship with inconspicuous design and the various connection possibilities. I also really like the reworked MIUI. Headphone connection and memory expansion in such a top model are meanwhile unfortunately almost a rarity. With the Pocophone you hardly have to make any compromises in my eyes. If you really want to be small-minded, you could criticize the display, which is good, but not very good. We also miss NFC – Xiaomi has really left some potential there. Also, the secondary camera on the back and the loudspeaker are certainly not the measure of all things, but they definitely didn’t fail on the test bench. The fact that the Poco F1 doesn’t have an IP rating is “normal” in the world of China smartphones, but it’s a disadvantage compared to flagships of the big manufacturers. 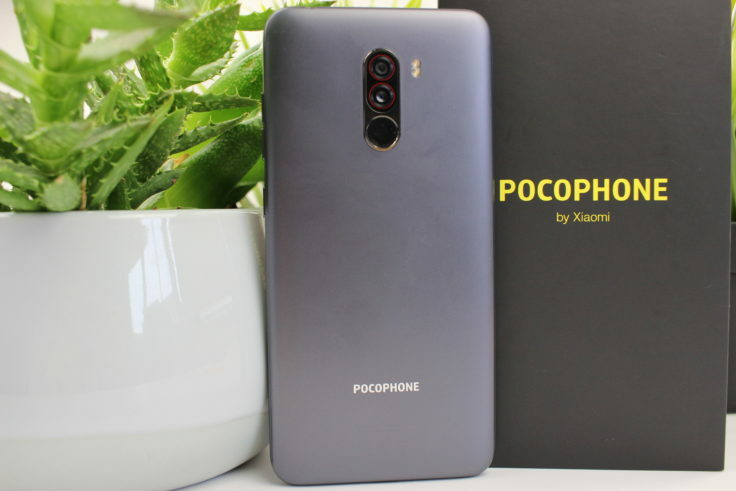 For me, the Xiaomi Pocophone F1 is a price-performance hammer and occupies a position that otherwise only the Xiaomi Redmi Note 5 occupies. I can fully recommend the Poco F1. In direct comparison to the Mi 8 it has the slightly worse camera and also “only” an IPS LC display and no AMOLED. But this is compensated by the lower price plus the connection possibilities and the better battery life. have meticulously searched for mistakes and hoped to find more, but actually Xiaomi succeeds in getting a point load here. As long as you don’t depend on NFC (Mi 8) or want to charge wirelessly (Mi Mix 2S), the Poco F1 offers the best price-performance ratio of Xiaomi in this price range! Phone looks great but do they work in the states? And what phone carrier’s do they support?